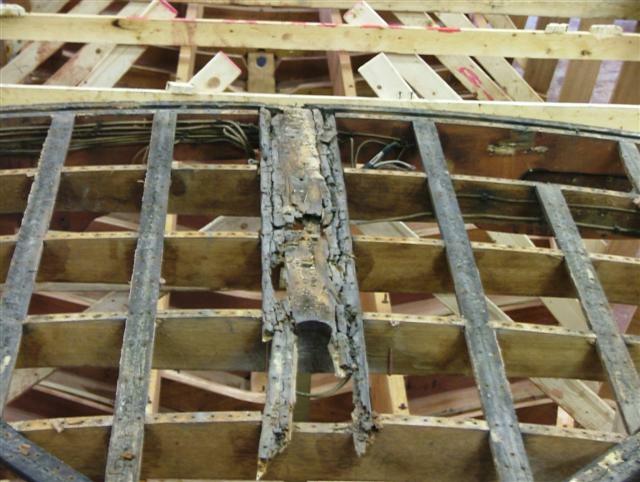 The most important aspect of wooden boat restoration is a sound hull. It does not really matter what kind of bottom construction you choose, except with regards to longevity. Remember, the bottom planking is not, in any way, meant to hold the framework together, quite the opposite is true. 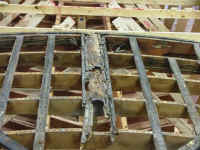 When doing a standard bottom restoration, the hull is turned over, the bottom planks and top sides chine strakes are removed, and the framework and fasteners properly addressed. 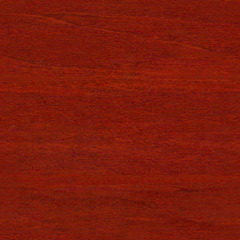 The original planks are saved for patterns only, as a standard bottom job includes all new mahogany planks; the labor to save the weakened old wood is more expensive than replacing them with new and the benefits are obvious. As I have stressed repeatedly, it's critical that you eliminate weaknesses in the framework and fasteners in order to minimize failure rates in the bottom planking. The hull is brought plumb and level. The gripe, keel, chines, and lower transom bow are removed from the boat, degreased, inspected, replaced if necessary, sealed, bedded, and re-installed with new silicon bronze carriage bolts. While these components are out, the bottom frames are likewise degreased, inspected, replaced if necessary, sealed, and bedded, and all fasteners, including the carriage bolts in the bilge stringer, are removed and replaced with silicon bronze. 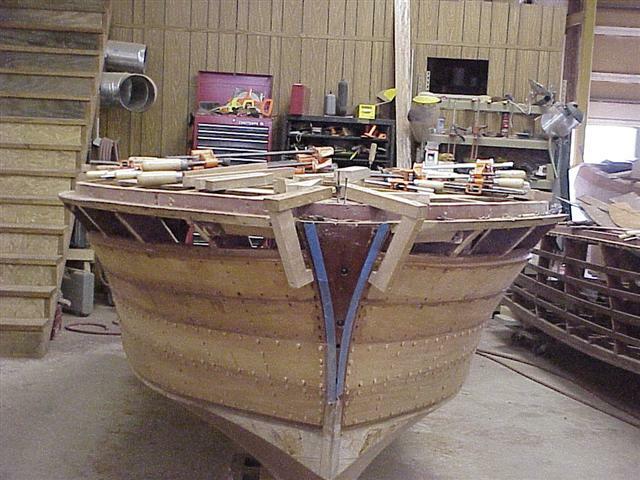 If the hull is not straight, plumb, and level now, it never will be after it is planked---the planking will secure whatever shape the framework is in now. Check carefully for all things that are easy to get at now before the bottom is applied. 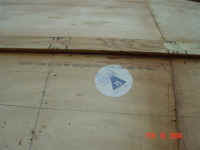 Make sure that all of the weep holes in the frames alongside the keel are adequately sized and sealed. The sides of the bottom frames are easiest to paint now. Surfaces in the bilge areas should be sealed with CPES and a light coat of bilge paint, usually an alkyd enamel. Too thick of a coat can keep excess moisture from gassing. I make quick work of it with a 6-inch paint roller and a 2-inch brush in the corners. I favor double planking with a bedding compound between the layers. The size and placement of the planking layers should be as close as possible to the original factory construction, with one exception. I use sheet plywood in place of the original inner ply of 6-inch diagonal slate, which are notorious for collecting dirt, debris, and moisture inside the bottom construction. 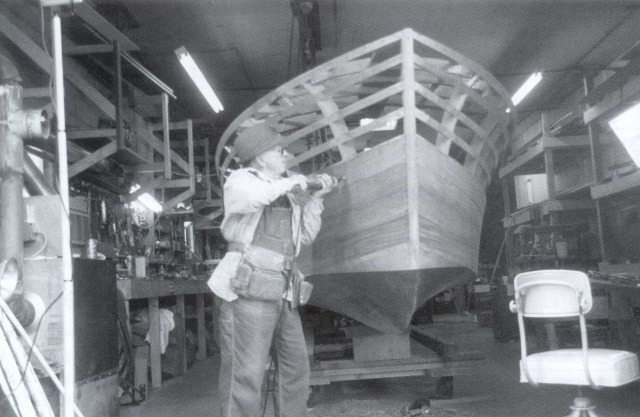 Some manufacturers, including Chris-Craft, switched to plywood for the inner layer sometime in the 1950s. If you do not want to upset the judges, scribe diagonal lines on the inner face of the plywood and re-install the little pan head screws wherever the inner bottom can be seen through hatches. The size and placement of the fasteners should be as the factory installed them. The original brass fasteners should all be replaced with silicon bronze. The real debate is what kind of bedding compound to use. Originally, builders used linseed oil-based boatyard bedding compounds with a layer of absorbable canvas to hold it from being washed away. This method does have its problems, however. While some believe that it will leave the bottom planks easy to repair, it is still the same six-year lifespan bottom construction delivered by the factory. Even if the inner ply is bedded in rubber to keep the bilge dry, water will still exist between the planking layers. This type of bottom will experience expansion and contraction every season, elongating fastener holes and eventually cracking frames and planks. Compressive set at the edges of the planks will create successively larger gaps each year. This type of loose construction invites dirt, debris, and rot spore. The vehicle of the bedding compound (mineral spirits) eventually evaporates and the bottom must be re-done. Some restorers favor "epoxy encapsulation," in which the plank layers are glued together with a hard epoxy resin mixed with thickening agents. All surfaces of wood components are encapsulated in a hard epoxy resin coating meant to stop any moisture movement at all. In my opinion, this material should only be used in new construction with much thinner planking material. Professionals with temperature and humidity-controlled shops can re-design and build long term vessels with this technology using methodical procedures. No moisture at all can be introduced to any part of the structure or enough wood expansion will simply tear surface fibers off, leaving one face of the joint bare and un-bedded. All surfaces, inside and out, must be encapsulated and maintained against trailer scratches or minute surface cracks caused by expansion and contraction due to temperature differences or an inflexible hard ride. And, as discussed previously, encapsulation of wood does not allow it to dry out if moisture does get in. This can incubate rot spore, causing it to grow at vastly increased rates. Plank replacement requires routing the damaged plank out. A third option might be called "enhanced traditional" bedding, in which all wood is sealed with a flexible penetration sealer that significantly slows the movement of moisture but does not completely stop it. All wood-to-wood joints are bedded with a flexible marine adhesive sealant that flexes with the movement of the components to maintain the seal. The bottom is coated with an underwater barrier coat primer to keep moisture out of the planks, thus diminishing expansion and contraction. With this method, plank replacement does require routing the damaged plank out. To achieve long-term results, the encapsulation, albeit flexible, should be repaired if damaged by component movement or trailer scratches. With the bottom sides complete and painted, it is time to flip the hull upright and address the topsides, the area of the hull between the chine and the deck at the shear. If you intend to strip the topsides varnish it is easiest to do this while the hull is still upside down. At this time I recommend removal of the deck. This is an opportunity to make your deck framework--and thus the boat-- straight, tight, and secure from existing rot conditions. Address the deck beams before re-planking the hull topsides. I recommend that you replace your topside planks with sound, new wood. It will cost less in the long run and last longer then re-using the dried, brittle, cupped, and cracked wood that originally came with your boat. If your determined to preserve the brittle, cupped, and cracked original wood, use the following procedures. I rarely re-use the old wood unless the customer requires it after fully understanding that he is getting a product substantially inferior to new wood at a cost, due to labor, from removal to fairing, that is at least twice the cost of new wood. Remember, however, at the very least you must expect the original wood to react differently than it did when it was new; you must expect unsightly surfaces and occasional repairs. The Router method of fitting new planks is an ingenious blend of new technology with old material procedure. It is the one innovation that makes planking a hull with new wood. In the end, you have a far more sound and usable hull. I first read of the router method many years ago in both Classic Boating and WoodenBoat magazines and was immediately impressed by its speed and accuracy. One no longer needed years of experience tediously trial fitting planks with a hand plane. The basic concept of the procedure is that a fence attaches to the router base and rides along the top edge of the chine or previously installed plank and trims the bottom of the next plank to an exact fit. An added benefit is that the base of the router follows the router bit to cut the correct bevel edge for a dead-tight fit, plank to plank. Before starting this procedure, complete all frame, plank batten, and deck beam repairs and have a thoroughly secured hull that is plumb and level. The hull should be blocked up high enough so that you will be operating the router in a comfortable position in front of you. 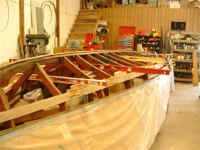 Temporary bracing from the chine to floor will help hold the hull in shape while you are working on it. Take diagonal measurements of the transom to insure it is square. Half-breadth measurements, outboard from a taught centerline with plumb-bobs to the keel, should be taken at every frame station. 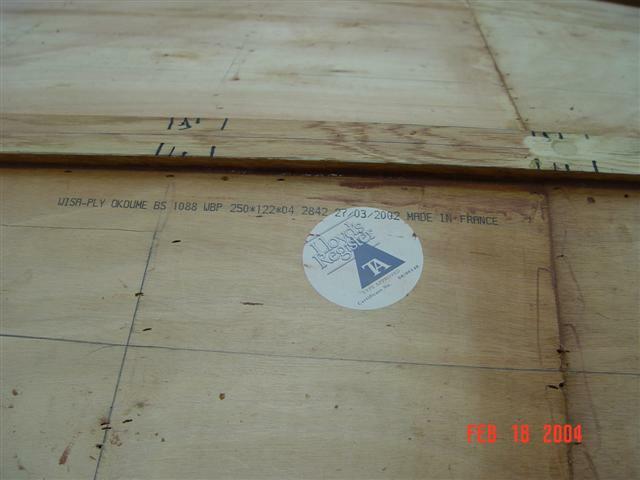 The hull should be square, plumb, and level and all frames, including deck beams and plank battens, should be properly sealed, bedded, and re-fastened before the topside planks are installed. At the risk of sounding redundant--but I cannot stress this enough---once these planks are secured, they will hold whatever shape the hull frames were in, straight or not. Make sure that your work area allows for planking both sides of the hull at the same time. If you attempt to plank the hull one complete side at a time, the weight of the planks as well as the tension created by thousands of fasteners will pull the topsides out of shape. This will cause the boat to always want to pull to one side when underway and look noticeably crooked at the stem or stern. A serious buyer would consider such a hull no more valuable than a gray boat. The deck of an antique or classic boat has two great enemies in the struggle for survival---the wind and the sun. Because of its exposure to the elements, the deck planking does not remain long at or above moisture saturation levels, which can host rot spore. Decks may rot, but they do it from the inside out where moisture can accumulate between joints of un-bedded planks and frames. The weather can make wood look good at the surface while it is devastated below. Given that the value of these collectible craft has risen so greatly, so recently, the most visible part of the commodity, the deck, is easily recognized as the first place to invest cheaply, if one's personal values could allow this. "Mop & Glow" is one industry term for a "restoration" that involves varnish, chrome and little else. But as with the rest of the boat, the important parts that exist below needed attention as well--I highly recommend at least the removal and replacement of all deck planking. The outer covering boards are the place to start, especially with the large, thicker post war covering boards. These were normally mounted on a horizontal sheer shelf, very often made of pine, which was used in place of the earlier vertical sheer clamp. Water finds its way down the sides of the deck and underneath the metal rub rail at the sheer. This water then wicks its way sideways under the covering boards. Being protected from the wind and rain, these areas do not dry as exterior surfaces do. Since the factory did not seal or bed these interior surfaces prior to assembly, the aged bare wood surface draws in this moisture like a sponge. Even if rot has not gained a foot hold here yet, this moisture is drawn up to the underside of the surface varnish coats by the heat of the sun. If the surface gets hot enough, the moisture vaporizes and expands, causing varnish coats to bubble from the surface. The live seams between the individual deck planks also admit water that collects between the planks and plank batons below them, causing the same problems to occur. Likewise, hardware fastener holes and crash pad upholstery edges will will do the same. It is for these reasons that all deck planking, either new or old, should be well sealed and bedded to protect from moisture incursion. Ignoring such areas of known trouble spots will cause a great deal of future expense in money and time involved with maintenance and repair.